Back in 1992, back when Cormac McCarthy was reclusive and neither rich nor famous, The Southern Quarterly devoted an entire issue to critical essays on the emerging author and his works. Most of these have been reprinted in newer collections, but one of the most outstanding essays was not and it became a rare and much sought after item, for, among other things, it reveals McCarthy's spirituality. That essay is Garry Wallace's "Meeting Cormac McCarthy." Excerpts have been quoted here and there, but the entire essay must be read to grasp its artful nuances. Garry Wallace is a stylist, and his simple sentences are freighted with implications beyond the words. The good news is that he will soon make available a book of his award-winning essays, including this one, so that they can be ordered on-line. After deconstructing his McCarthy essay last week, I did a search to find anything else written by him. 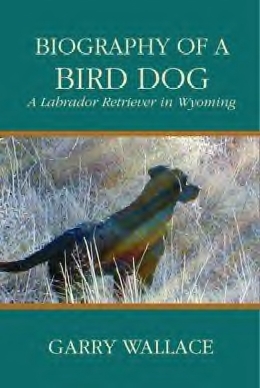 His 2007 book, BIOGRAPHY OF A BIRD DOG, is still in print, so I sent for that. I'm a seasonal reader and I like to read dog stories in the fall, in hunting season, so I figured I would put it on the back shelf until then. But I was immediately drawn into this artfully constructed work of creative non-fiction. I found myself rooting for the man and his dogs, drawn on by his troubles and trials and his insights into them. Wallace, who teaches biology and writing at a college in Wyoming, is very widely read, and he draws on that reading time and time again for insights into the human/canine condition. The pages seemed to fly quickly. It is a large easy-to-open trade paperback, and the print is easy to read. But what makes this 490-page book a quick read is the author's engaging style, the magic of his prose, the telling. The next thing I knew, my wife brought me dinner on a tray instead of calling me to the table. She's seen this before. I thanked her and read on. I was sorry to see the book end, but grateful for the experience. You know the feeling. There's an epilogue, then an about-the-author page, then a list running several pages of the author's suggested reading--from which I've now ordered a couple of books. This is, first, a character-driven work of creative non-fiction that touches on many facets of the human condition. There is naturalism here, a cycling of life, death, and rebirth. It is also, naturally, a dog story, a personal memoir full of literary references, and a western pastoral beautifully told. I say so having paid the full price for the book at Amazon unsolicited, with no agenda other than to spread the word about this gem. I contacted Mr. Wallace and asked for an interview. He was kind enough to answer my questions--impressively, as you shall see in the next post. Great post, and I look forward to reading your next post with the Q&A with Garry Wallace. It's interesting that Wallace names only one McCarthy novel as among his ten favorites, and chooses, among all of McCarthy's novels, The Crossing, which was published after his essay "Meeting Cormac McCarthy" was published, after Wallace had apparently already become a fan of McCarthy's novels. And, I'll put Wallace's Bird Dog on my looong to-read list.